When the going gets tough, the tough get, well in Jeremy Corbyn’s case they get going to a safe seat with a thumping majority of 24,000 to make a landmark ‘personal’ political speech. The Labour leader was in my manor (as we’re supposed to say around here) so I nipped along to London Metropolitan University in the East End where Whitechapel’s mix of rag trade, council flats and barista coffee bars meets the gleaming towers of the City. The geographical symbolism was shrieking ‘I am in my comfort zone right next to, but so far away from enemy territory’. 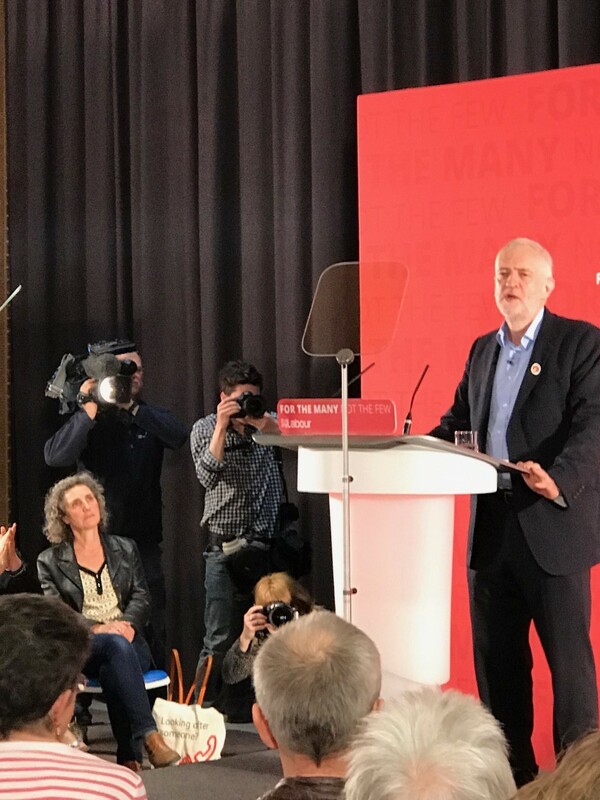 This was a campaign speech so a new slogan was launched: “A reckless and rigid Brexit” as part of the usual Corbynite narrative that paints the Conservatives as hell-bent on the destruction of the welfare state and determined to engineer a shift in wealth and power from the many to the few. 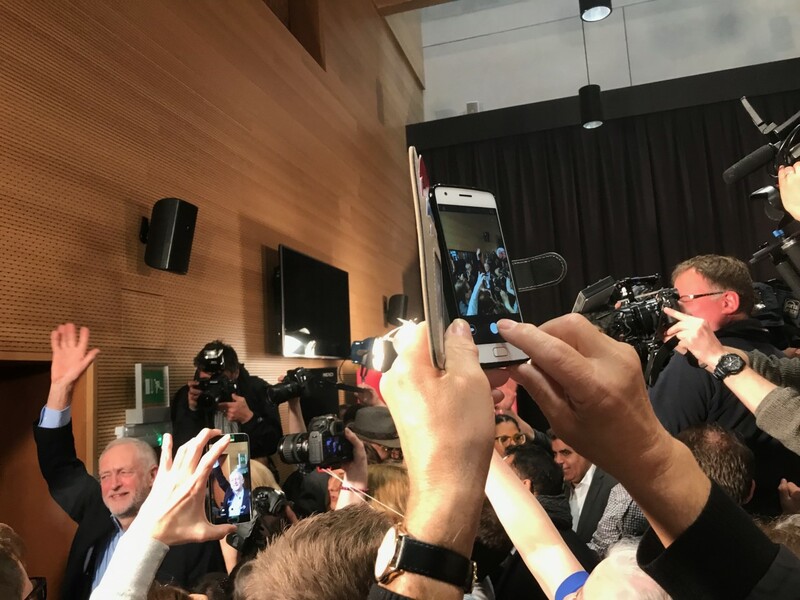 But what was most interesting was that Corbyn consciously took the opportunity, speaking to invited loyal party members, to talk about himself. He doesn’t do that often. As he pointed out, he doesn’t like to personalise politics and he promised not to do it again. But what did he reveal about the man, rather than the politician? There is a tradition of political leaders trying to show their human side. John Major famously drove past his old home in Brixton. Neil Kinnock even had Oscar-winning director Hugh Hudson make Kinnock: The Movie as a deeply biographical party political broadcast. ‘Vicar’s daughter’ Theresa May has talked about her Christian faith. But when Corbyn talked about his life he only talked about politics. He talked about a career where he has always said challenging and unpopular things to those in power. When the Tories were hobnobbing with apartheid South Africans, he was campaigning for Mandela’s release. When Labour was sucking up to the bankers before the 2007 Crash, he was the one warning of the evils of global capitalism. If this was a self-portrait then it was a painting of a prophet wandering the wilderness whose time has now come. People will say that this is simply Corbyn’s ‘modesty’. In fact it comes across as incredibly self-satisfied. Perhaps the fact that he could make no emotional, biographical connection is because there isn’t one to be made. The voters will judge whether that matters, but it does seem to confirm that this is someone who might say he listens and who seems genuinely to care, but who can’t communicate a personal vision and character. Into that vacuum the voters are pouring their own impressions, prompted, in part, by what they see, read and hear via social and mainstream media. ‘Ordinary’ voters in a focus group say they don’t like him and even won’t vote Labour because of him. He’s scary”, “silly”, “a joke”, “a wet blanket”. No doubt Corbyn supporters will blame the news media for creating those perceptions but I suspect a lot of the negativity is produced by the fair coverage as well as the messages he and his supporters send out. Corbyn makes no effort to appeal to anyone except those firmly on his side. His Whitechapel speech attacked the Tories – but in effect anyone who is not loyal to him – as an enemy of the people. That divisive language combined with his deadpan party apparatchik style doesn’t help. Politics is about emotional intelligence as well as policy propaganda. If the poll ratings for Labour and its leader are even remotely true, then they are staring defeat in the face. Here in the fastness of the East End with its rich history of fighting fascism and embracing immigration Corbyn chose not to appeal beyond his base. It is not surprising then that the rest of the country finds him so unappealing. This article by Professor Charlie Beckett, director of Polis, the LSE’s journalism think-tank. An interesting column by New York Times’ writer Bret Stephens seems relevant here. He’s talking about the danger of over-certainty in politics and how that puts off the very people you are trying to persuade. Often because it is based on over-interpretation of data. Stephens is talking about climate change but it seems to apply to UK politicians, too.